After establishing all relevant background information, collecting first hand research and actually testing existing airport environments was the next logical step. To find a valid conclusion to the initial research question the analysis was carried out in terms of usability and accessibility for the visually impaired. The probably strongest tool in the evolution of any practice is trial and error. Learning from mistakes made in the past and finding ways to prevent repetition in the future is essential for progress. It is therefore necessary to learn about, and evaluate the integration of set rules and guidelines in place to successfully design solutions for those with low vision. 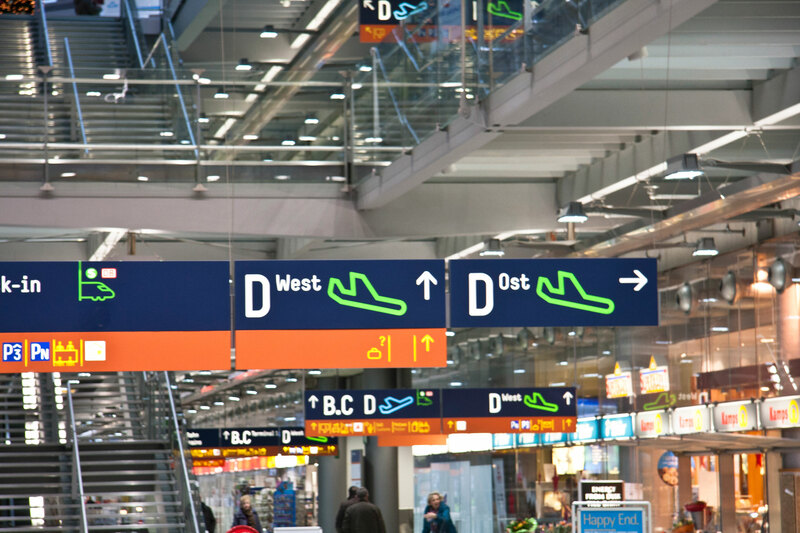 When analysing navigational systems – and therefore combinations of signage and information displays containing typographic and pictorial elements – differentiating between legibility and readability is important. Colour and light are the most basic factors influencing human vision. Understanding legibility in this context, it has to be considered in a three-dimensional form. It is the relationships between the source, the object and the observer that have to be considered “both individually and in their totality.”[2.] Legibility then refers to the ability and degree to recognise or perceive any given piece of information. Readability on the other hand describes the ability to give meaning to the identified objects, may they be in word or pictorial form. It is the cognitive process of interpreting e.g. texts or pictograms enabled by set cultural or social conventions, such as language or behavioural standards. Positioned almost central in Germany, the commercial airport in ‘Frankfurt am Main (FRA)’ welcomed about 53 million arriving and departing passengers in 2010 alone. 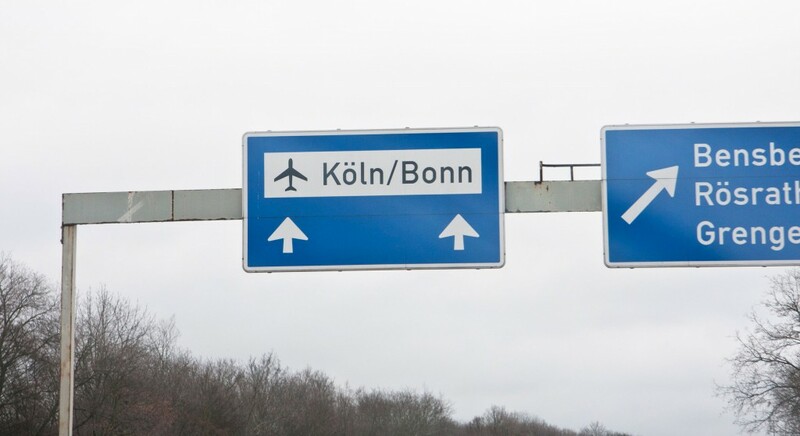 That makes it by far the busiest airport within Germany – ‘Köln/Bonn (CGN)’ airport in comparison counted just slightly less than 10 million travellers within the same time span.[3.] Globally FRA ranks 9th behind for example PEK, LHR and LAX. 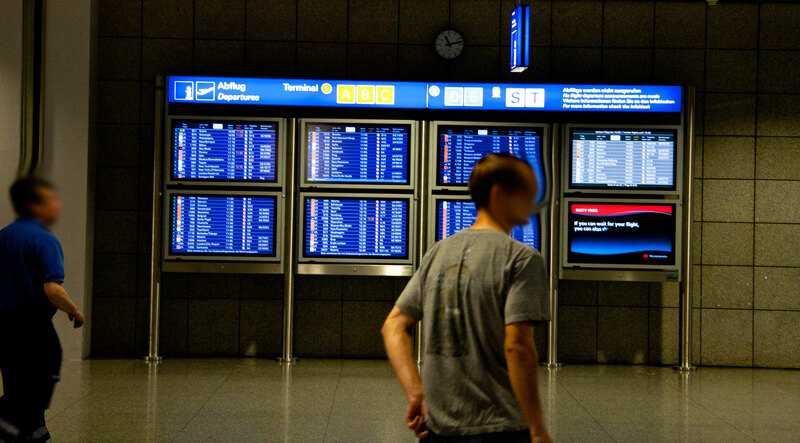 Chosen for its size and sheer countless number of trafficking passengers, Frankfurt airport was the setting of initial observation and interviews for the researching of this dissertation. A meeting was arranged on the 5th of September 2011 during which I met Mr Jacobi, an employee of the marketing department, and Ms Press, the head of the ‘FraCare Service GmbH’ – which is the company in charge of supplying assistance and care to passengers according to the ‘EU Regulation 1107/2006’. The main finding of my conversations and questions was that Frankfurt airport endeavours to give the best possible support for all people that require it by supplying personal help services and mobility aids. As stipulated in the ‘EU Regulation 1107/2006’ they rely on passengers to inform the airline or booking agent at least 48 hours prior to departure and making themselves known upon their arrival at the airport. They will then be welcomed and assisted by personnel of the ‘FraCare Service GmbH’ and accompanied throughout all processes they require help with. Ms Press stated that in 2011 the service assisted roughly 560 to 570 thousand people. 1% of people with mental and cognitive impairments. However the above statistics cannot be used as a representative measure stating the types of impairments people using aerial travel have. It merely includes all those that register with and use the help of the assistive service located at the airport. According to Ms Press especially users with visual impairments often travel with and count on the support of relatives or close friends instead of relying on a ‘stranger’ for help. This unknown number of people making their own struggle through the airport environment makes anticipating their needs and catering for them ever the more important. To analyse and assess how successful an airport environment can be navigated independently, I chose to carry out an ethnographic study at the much smaller ‘Köln/Bonn (CGN)’ airport. 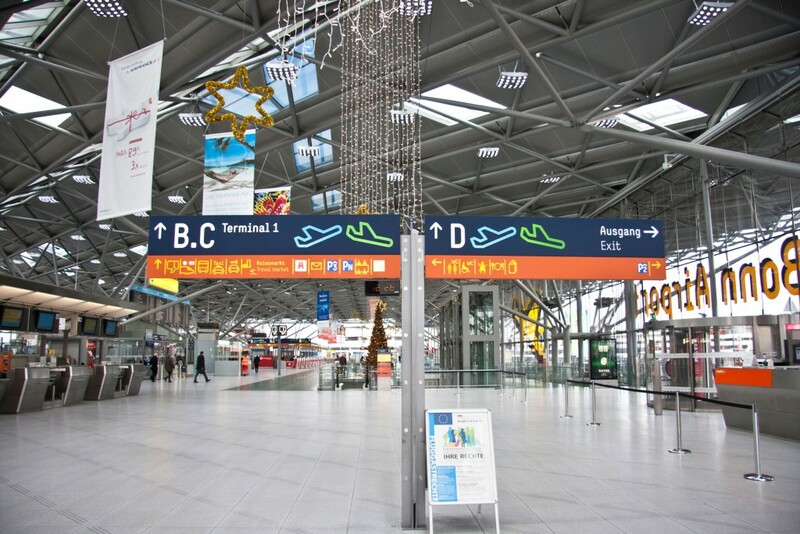 I selected this airport because of its more recent design and smaller layout, which should imply a fairly successful implementation of inclusive design techniques. The test person I selected is a 67-year-old male, wearing glasses to correct a hyperopia but generally in good physical health. Establishing the usability and implementation of inclusive design standards for the elderly demographic with visual impairments, a suitable test person needed to be selected. It seemed logical choosing to observe a user, just over retirement age, suffering from only slight physical and cognitive impairments, since this is projected to be the major demographic in future developments. 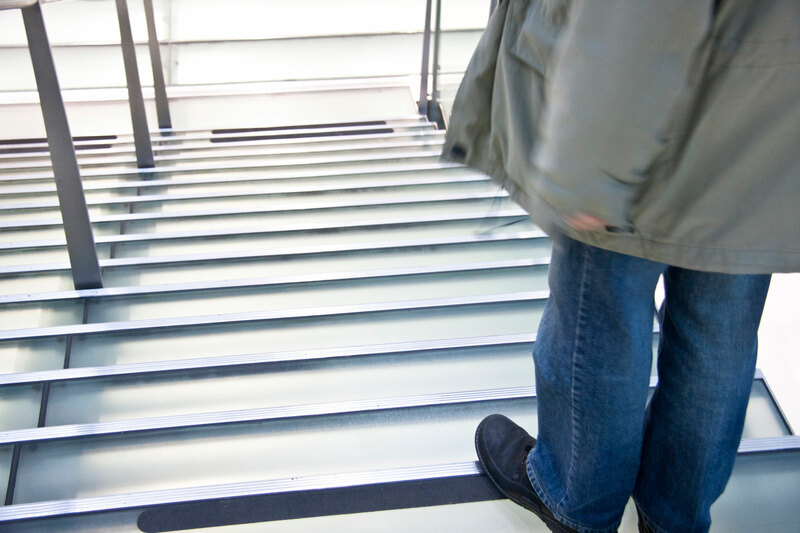 Also all problems encountered by a person affected by reasonably slight impairments can be applied to people with more severe disabilities at much higher effect. Whilst the presented findings will mostly centre on the visit at CGN airport, parallels and comparisons will be drawn to initial observations at FRA. Making our way to the airport signage on the motorway was well placed with all other directional instructions and in a pictorial and easy to understand format. Entering the actual airport driveway I informed the test person that our flight would be departing from Terminal 1 and asked to find their way to a disabled parking spot. 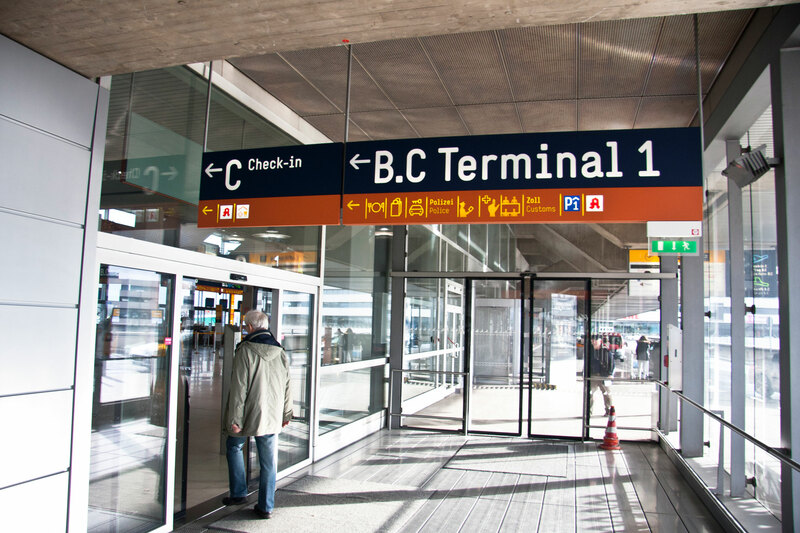 There is only one way when following the signs for departure; it first took us past short time parking and the drop off zone for Terminal 1. 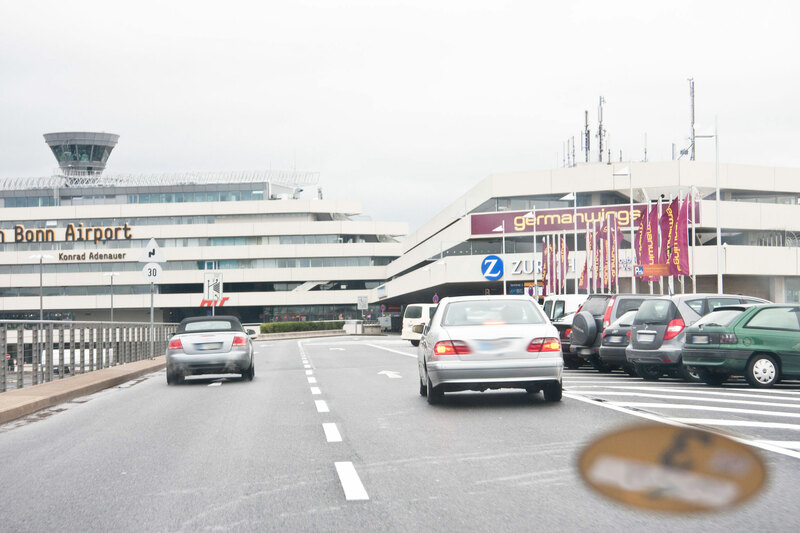 It then curves around, passing Terminal 2, finally leading to one of the three bigger car parks. 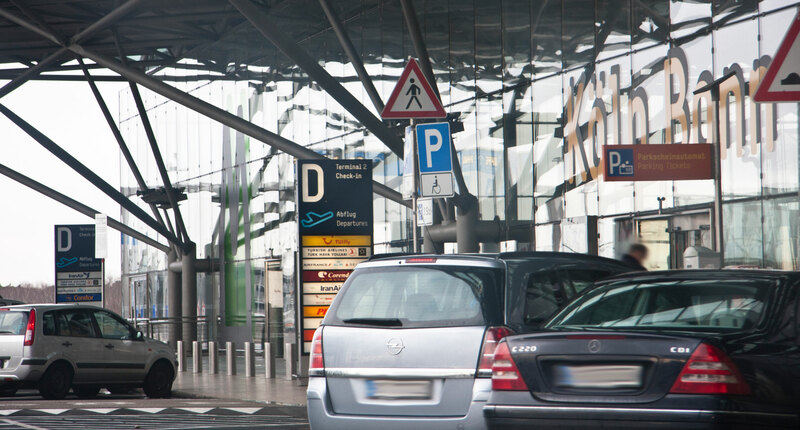 This makes the actual process of arriving and driving into the airport very easy. Locating the disabled parking spot on the other hand proved rather difficult for the test person. Passing all of Terminal 1 and the drop off zone he could find no allocated or priority area of parking for people with disabilities. Neither could he see any signs or directions showing him where to find one. 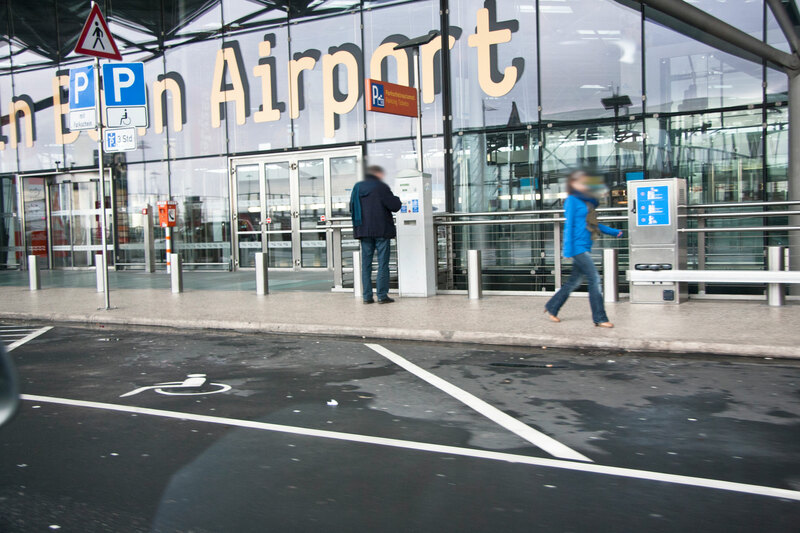 Only when arriving at the main entrance of Terminal2 and almost leaving the airport towards the motorway again, he spotted a sign indicating parking for disabled visitors. 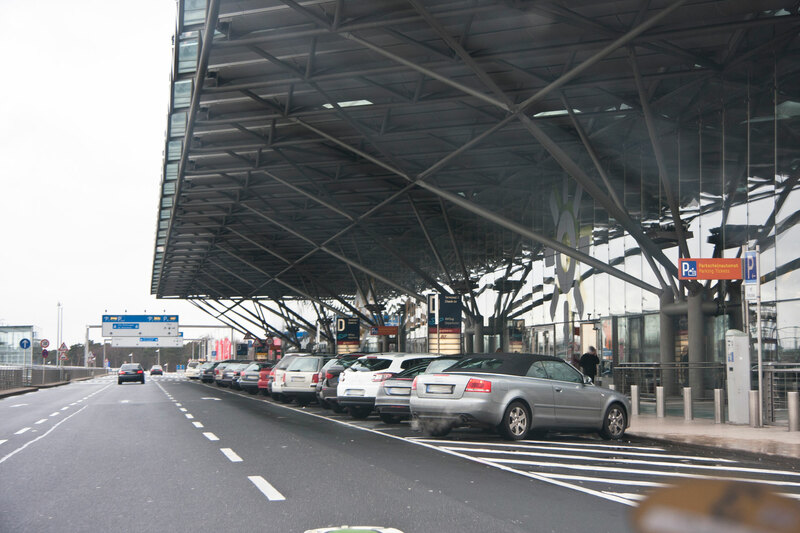 Although the position of priority parking is ideally situated right outside the main entrance for passengers using Terminal 2, the signage leading to it is literally non-existent. 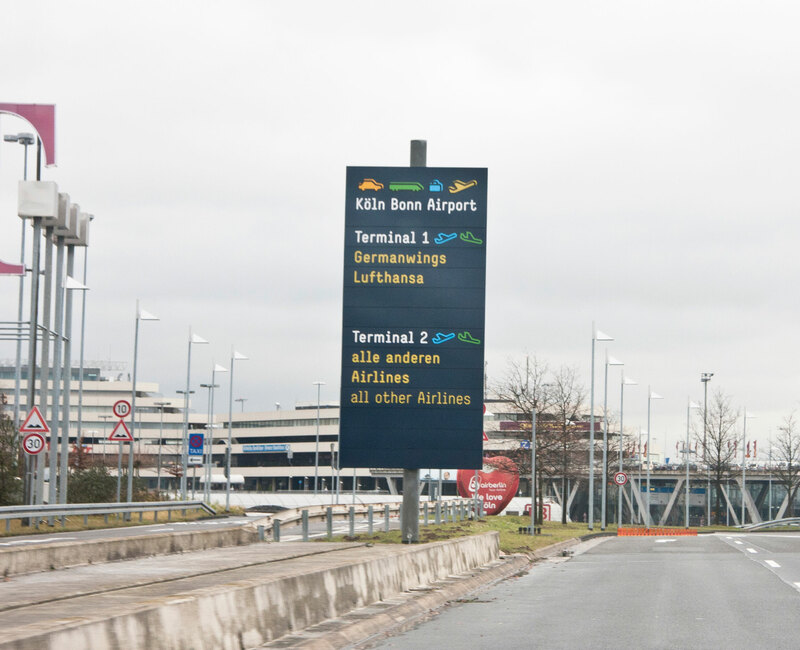 Also passengers departing from Terminal 1 can only use the regular and usually fairly busy drop off zone, or accept making their way back through the entire Terminal 2, or from one of the car parks. I now asked the test person to park the car in a nearby car park and we made our way back to the disabled parking spot, setting it as the starting point of all further navigation. Entering the terminal building we are confronted with a long row of check-in desks. The overall building is very open with dramatically high ceilings and huge areas of windows allowing natural and even illumination. Harsh contrasts between dark and light areas have been successfully avoided and at this time of the day, the artificial lighting is almost not noticeable. Seemingly this is a very quiet day at the airport, and the view at the nearest navigational element, an overhead sign, is clear. But even if there were people around it should be visible since the sign is placed at an estimated height of 2.5 metres at its lower edge. It therefore strikes a good balance between keeping a good viewing distance and being high enough to not be covered by passing people. 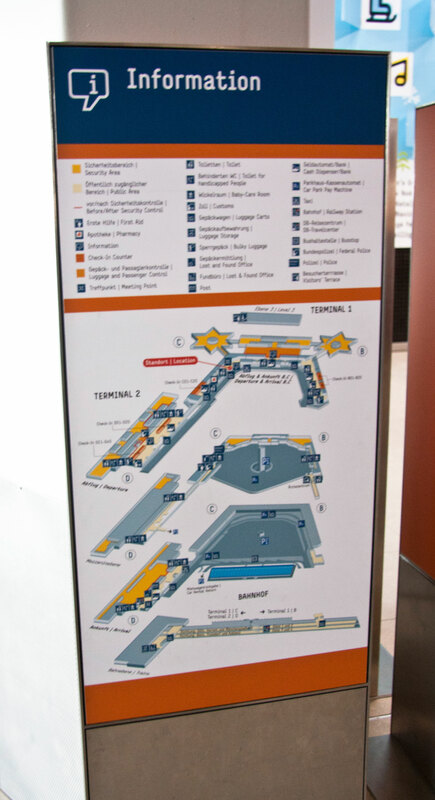 The airport is divided into three main areas, Terminal 1 B, Terminal 1 C and Terminal 2 D, each consisting of departure areas on the upper and arrival areas on the lower floors. Looking at the sign the user could easily identify the main navigational elements. He was able to clearly see and understand the symbols for arrival and departure (elevating and landing plane outline), and see in which way the areas B, C and D as well as the nearest exit were located. Before continuing his way back to Terminal 1 the user asked to find the nearest bathroom. He therefore made use of the lower part of the overhead sign consisting of secondary navigational elements. In mostly pictorial form he could see pointers toward restaurants, shopping areas, changing rooms for babies, the nearest ladies, gents as well as wheelchair friendly bathroom on one side and references toward means of public transport as well as an information desk on the other. Identifying these elements however took him considerably longer and he had to take a few steps closer. Contrast ratios between visual elements and their containing material should be kept as high as possible for good legibility. Darker colours of the spectrum against white or very light tones are desirable although certain colour combinations should be avoided due to common visual impairments effecting colour perception. The ‘Clear and Large Print Best Practice Guide for Designers’ developed by the ‘Royal National Institute of the Blind (RNIB)’ and the ‘International Society of Typographic Designers’ states[4.] that blue/yellow and red/green combinations should be avoided because of the problems they create for people affected by colour-blindness. Also considering the rare form of vision deficiency where no colour perception exists, it makes sense to view grey scale versions of all developed designs to ensure good contrast ratios. The lower part of the sign with yellow text and pictograms on an orange background creates a difficult contrast for the test person instantly, resulting in a slight complaint. One of the pictograms is even featured in yellow on white, which makes it almost completely unidentifiable. Initial observations at FRA were very similar. Overhead signage featured fairly good contrast values for most main navigational elements, whilst others were rendered hard to read with light blue on dark blue and even yellow on blue combinations. Further were backlit signs and overall extensive artificial lighting necessary in FRA because of its rather dark build environment within Terminal 1. This often created quite harsh changes between highly illuminated and darker areas and also created problems with some reflective surfaces. 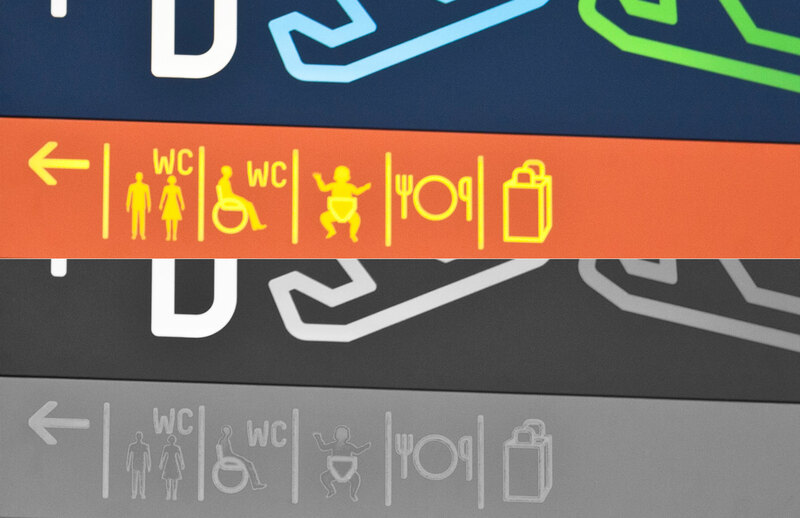 Following the signs all the way to the bathroom it soon became obvious that the low contrast colour scheme would be a reoccurring theme within CGN’s corporate identity. Making our way back from the bathroom we stumbled across a seating area and help telephone for disabled travellers. During my initial interview with Ms Press at FRA she explained that those so called help points were located all around the airport and arriving passengers or passengers experiencing any problems could contact the assistive services by using them. 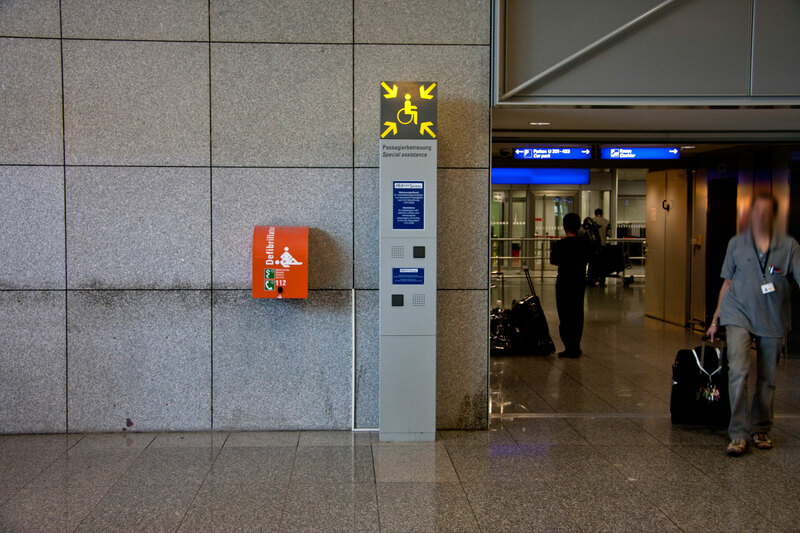 Unfortunately my previous research in Frankfurt also showed, that these help points were very hard to find, had no signage pointing towards them and were only marked in the most recently installed airport layout plans. 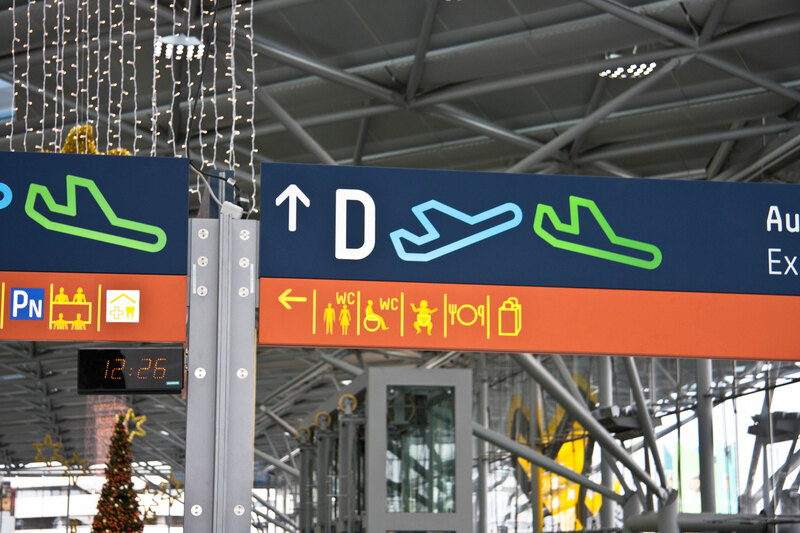 The situation was very similar at CGN airport where neither my test person nor I could find any signage or floor plan with reference to these help points. Further some of them were literally hidden in corners or behind walls. Now continuing our way to Terminal 1 the test person has no trouble following the overhead signs and its main elements. 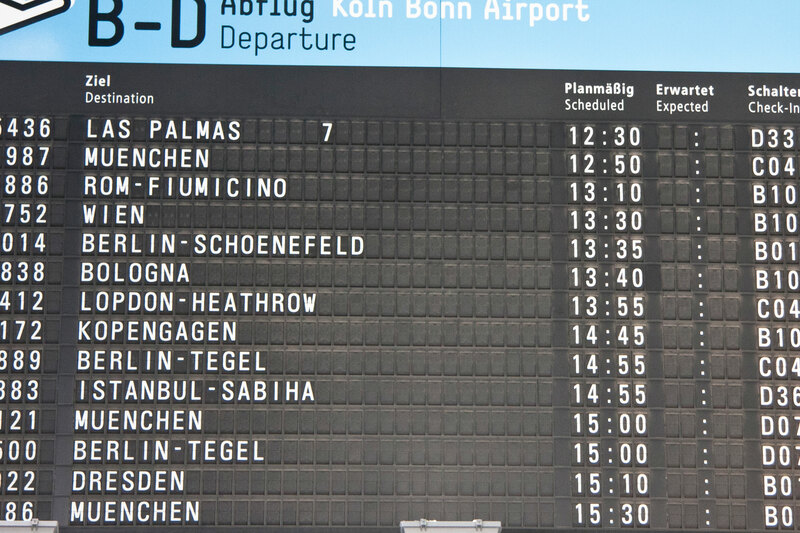 He also refers to the airport display board reassuring himself where he is headed. Considering the very large viewing distance of these signs and reasonably small type size and line spacing, recognition is very important. Entering Terminal 1 the much darker building makes us realise that the main overhead signage is actually backlit. This now improves on contrast for the lower part, however does not justify the original decision of setting yellow elements on an orange background. Terminal 1 is much busier than Terminal 2 and reassures us that the overhead signage is installed at a suitable height. 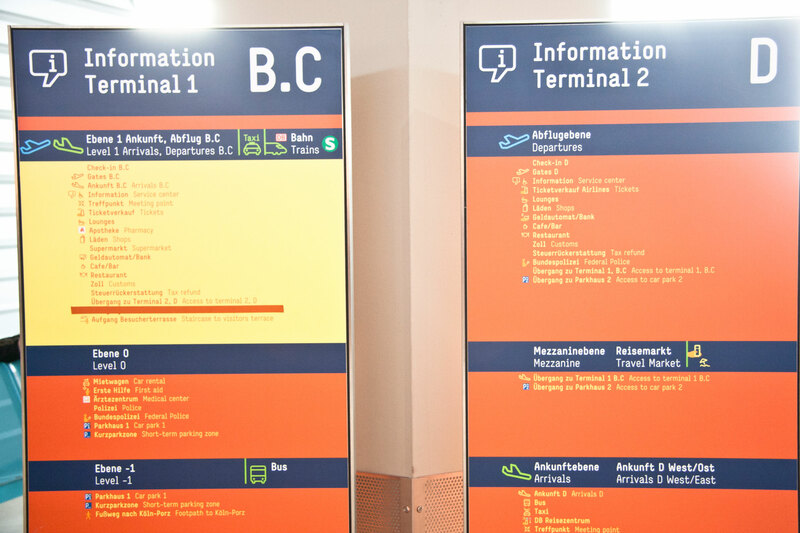 The darker base colour of the overhead signs also contrasts nicely against the much lighter inside walls and ceilings and make differentiating environment and navigational elements easy. Since the test person has reached his destination, he points out the check-in desks as well as entrance to security checks. I now asked him to find a layout plan of the airport. After a few minutes of searching and not referring to any signage, he finds an information desk. 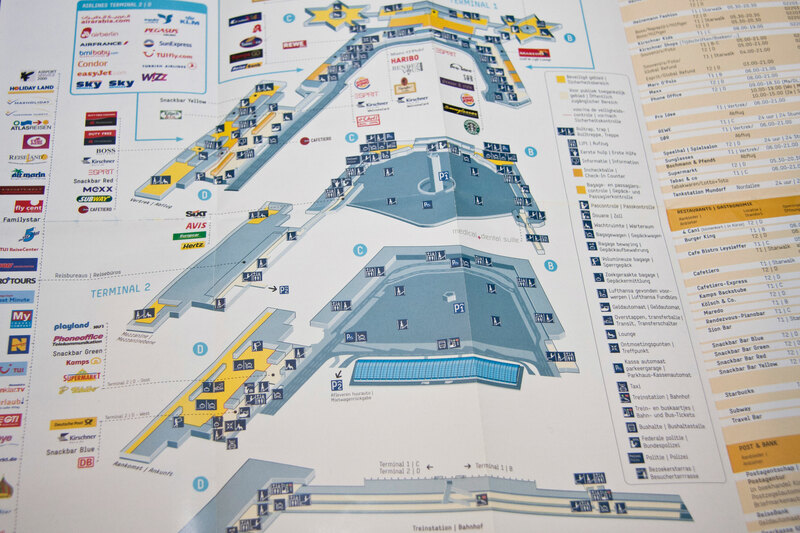 Located nearby are stands with printed and summarised information of the different airport areas, as well as a larger scale layout plan and leaflets with the layout plan to take away. In terms of readability black text on a white background sets the standard at which the usual reading speed is measured. Reversing this image creating white text on a black background will slow down the reading process by up to 14.7% whilst contrast levels still stay good for users with low vision. Using a background colour preconceived as ‘abnormal’ will slow down reading speed further.[7.] It is also useful to note that reversed out text on coloured backgrounds appears smaller than on white, this might make amendments in type size or weight necessary to compensate. Not only is reading speed decreased in the sign deppicted, but contrast levels are at their minimum again by setting yellow on orange and vice versa. Whilst the leaflet with layout plan is fairly structured and presented in a very organised manner, it is still quite filled up with information. All stores and restaurants as well as airlines are indicated and given more prominence than the most important navigational elements. Whilst all this information might be interesting and well enough to decipher for the average airport visitor, people with low vision will most likely get overwhelmed and already struggle with the fairly small type sizes of roughly between 7pt and 10pt. For type sizes in printed text a minimum of 12 point is the RNIB’s recommendation for Clear Print applications including people with low vision.[8.] Just like in all signage, the airports custom sans serif typeface is used. It is generally quite legible by not featuring too much contrast. Letter and line spacing however could be increased in some applications for better legibility. I asked my test person to try and find a layout plan or any printed documentation of the airport optimised for the visually impaired. Upon his return from the information desk he reported that there was no information material available in large or clear print or braille. 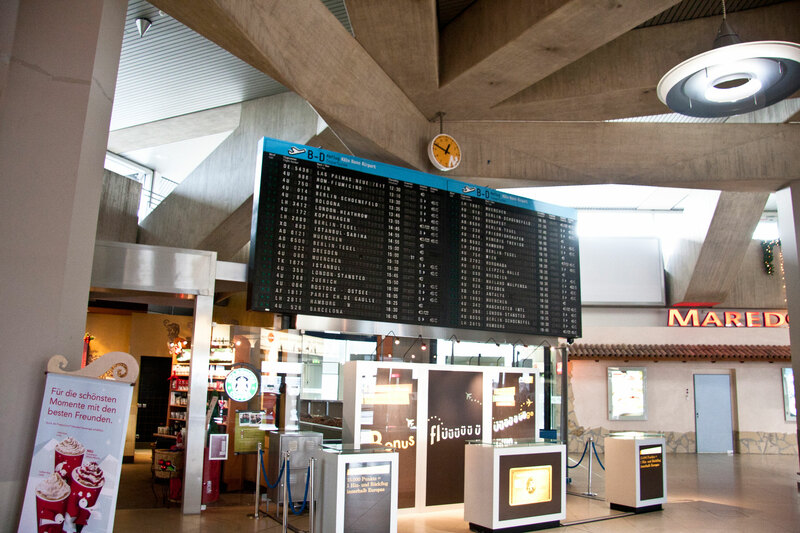 Airport staff however informed him that he could ask a member of staff for directions or if needed make use of the help services provided by the airlines and airport staff. Leaving the airport through the lower floors, I also documented that stairs had consistently marked edges for the first and last steps. Finally the test person complimented the large amount of signage as we were leaving. He said it was nice to always know and see where the next sign was going to be, almost like reassuring you were still on the right way.